There are many opportunities to touch, see and learn about sea life in Newport. From the Oregon Coast Aquarium to the Hatfield Science Center to the Undersea Gardens, there are several options to see wildlife up close and personal. While not as educational – or as hands on – as either the Oregon Coast Aquarium or the Hatfield Marine Science Center, the Undersea Gardens are a nice departure if you find yourself on the historic bay front. Housed in ship that is 150 feet long and 50 feet wide, walking down the gang plank off the dock feels like you are almost going diving yourself. Now, with all tourist attractions of this type, to get to the actual garden, you have to survive the gift shop on the upper deck, then work your way below deck, where you are surrounded by windows into the undersea world. Every 45 minutes or so during the day, the Undersea Gardens offer a “live theater” where a diver enters the garden while a narrator gives the crowd an explanation of the wildlife, fish and other species. The diver and narrator cover how starfish move, different eels, and an octopus that sometimes can be elusive. When the diver does coax the octopus out though, you can get an up close look at not only the tentacles, but also look at its beak. After the show many times the diver is available in the gift shop to answer questions and talk about diving and the sea life. Kids love this part of the show, and it’s worth the price if you do get a diver who is friendly and fun. If you don’t see a show, that’s OK, as there are benches and you can wander around below deck basically looking into a huge fish tank. Many times you find yourself eye-to-eye with wolf eel or other sea creatures, thanking the glass separating you and the spiny and ugly fish and crustaceans. There are more than 5,000 species in the Undersea Garden, and each diver show is different. The Yaquina Bay sea life can be captivating, and if you go during a slow time, you can have the room to yourself. Newport is the dungeness crab capitol of the world, and as such the Undersea Garden also has a display of the crabs. The gift shop on the top deck has all of the coastal tourist items you would expect. Hats, T-shirts, stuffed animals, statues and many other nautical-themed items are there for purchase. 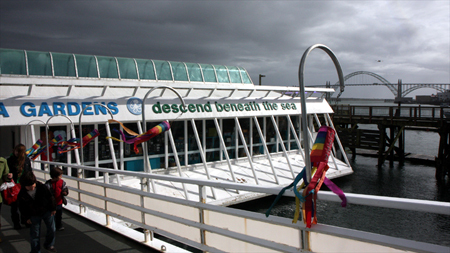 About the Oregon Undersea Gardens: Descend... into the magic submarine world of the Oregon – home of the largest collection of local marine life to be found anywhere! You’ll come face to face with the excitement, the wonder, the magic and mystery of the underwater world. Beneath the surface, all manner of fish swim through the kelp forest. Follow the remarkable life cycles of schools of fish in their natural habit. Amongst ghostly gardens of white and crimson anemones, the ferocious looking Wolf eel lurks and the largest species of octopus in the world glides the reef. What to bring: Photography is close to impossible in the bottom deck of the boat, so don’t lug it with you if you have a larger SLR camera. Tip: When you visit the bottom deck of the ship, you get no cell phone coverage. So if you are coordinating your visit with others, keep that in mind. Also, during the diver show the lights are turned off. If you have issues with smaller spaces, underwater, in the dark, this might not be the attraction for you. Season: The garden is open year round. Getting there: Type 250 SW Bay Boulevard, Newport, Oregon into the GPS and it is pretty easy to find. For those of you who don’t use technology while driving, when you are on the Oregon Coast, take Highway 101 to Newport, then follow the signs to the “Historic Bay Front.” The Garden is across the street from the building housing Wax Works and Ripley’s near SW Hatfield Drive.